Round Two for US-China Trade? One irrelevant graph and one (possibly) relevant graph, in light of Mr. Trump’s statement on additional trade sanctions. 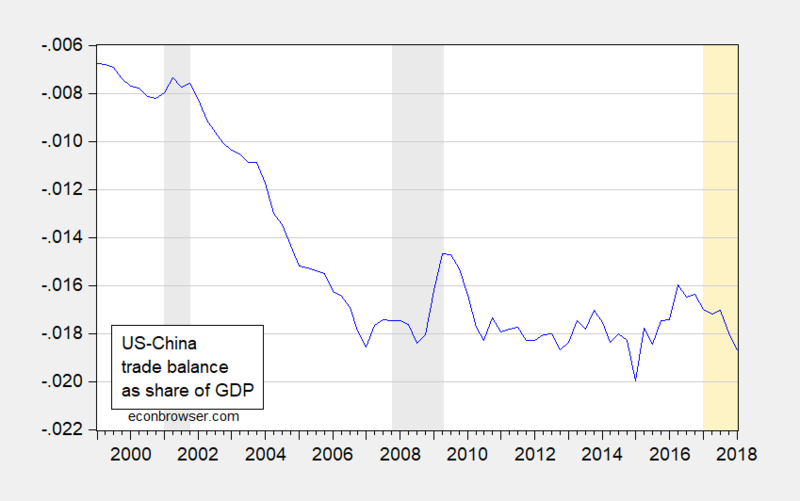 First, the irrelevant: the US-China trade deficit, which has been deteriorating over the first five quarters of the Trump administration. Figure 1: US-China trade balance (both goods and services) as a share of GDP. NBER defined recession dates shaded gray; 2017Q1-2018Q1 shaded orange. Source: BEA, NBER, and author’s calculations. Why one should care about the the bilateral balance, particularly when there is a large foreign value added share, is a good question, and one addressed here. (One shouldn’t). But to the extent you think of the bilateral trade deficit as “a loss”, well by that (stupid) criterion, we’re losing. Next, a possibly relevant graph. 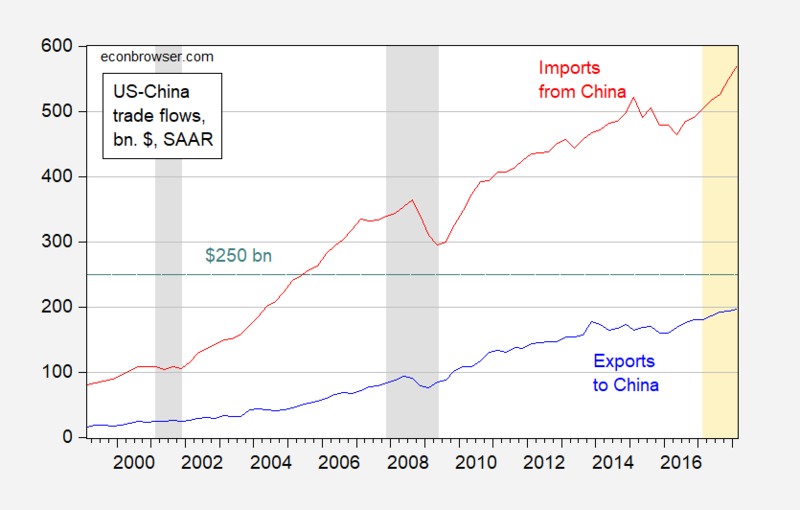 Figure 2: US imports from China (red), US exports to China (blue), both goods and services, billions of $, SAAR. NBER defined recession dates shaded gray; 2017Q1-2018Q1 shaded orange. Green dashed line at $250 billion. Source: BEA, NBER, and author’s calculations. The interesting point is that if Mr. Trump were to impose an additional $200 billion worth of imports covered, then China would be hard pressed to retaliate in a direct fashion, US exports to China are less than $250 billion. However, as Brad Setser has pointed out, this would mean that some consumer goods (PCs, tables, phones) would have to be taxed by the US, resulting in a more visible increase to consumer prices. There is also the question of who will experience more damage from the tariff exchange. Since China is on a managed float, it could intervene to weaken its currency to partially offset the tariffs (it’s not quite one-for-one, since depreciation increases the costs of inputs). There is also a question of whether say an additional $200 billion covered imports reduces US imports more or less than the corresponding tariff reduces Chinese imports. To the extent that Chinese tariffs are going to hurt primarily agricultural goods, then one would presume a fairly high elasticity of demand, so a big decline in exports to China. To the extent that China is exporting mostly differentiated manufactured goods, a priori, I’d think that those elasticities would be lower. Hence, I’d expect US imports from China to be more resistant than Chinese imports from the US. But that’s all speculation — and all cet. par. As mentioned earlier, the Chinese would undoubtedly manage the CNY. Then these elasticity estimates become relevant. This entry was posted on June 18, 2018 by Menzie Chinn. Oh wow – iPhones selling for $1200! $250b is ~ 2% of China’s GDP. Of course the actual economic impact on China will be a fraction of that (imported inputs = others hurt, China will export more to other markets, in many sectors the US will just pay the tariffs, etc). If there was actually free and honest trade with China, U.S. trade deficits, which have been used as a benchmark by the Trump Administration, would be smaller. It’s been said, China may not change its behavior, until trade measures are large and lasting enough. Perhaps, negotiations and compromise will take place before then, because China has much more to lose. Any retaliation by China can easily be met by the U.S.. China’s exports to the U.S. are much larger than U.S. exports to China, and China’s economy is much smaller in dollars. So, a trade war will have a much larger negative impact on China. to other countries. The end game for China is much worse than for the U.S.. If our allies, who also complain about China’s unfair trade practices join us, China will be in even bigger trouble. Utter gibberish as usual. If you actually make an honest comment one day – the world might just stop. I mentioned in the prior comment thread I couldn’t figure out why hog prices hadn’t been going down. I think maybe I was being a little “slow to the take” again. (Hard to imagine that isn’t it??). Reuters is saying demand for hogs is high from the packers. Also I read in one of those papers that I was talking about yesterday early morning, (maybe Menzie had already mentioned it and I had forgot) and it says only 5% of USA pork exports go to China. That actually shocks the hell out of me somehow, but the more I think about it the more I think that one should have been clear to me from the get go. Honest to God I’m not trying to make cheapshots here, but the pork in China really does seem sub-par. I mean God knows I ate about 5,000 tons of it in Chinese dumplings etc, (I’m not a food snob by any measure, other than possibly cleanliness, and that’s even arguable) but Chinese pork is not especially great. I mean, I grew up eating a significant portion of packaged macaroni and cheese and canned pork and beans out of necessity—that pretty much kills any food snobbery one might be inclined to have. Thanks for the elasticity and Exchange Rates paper Menzie!!! Putting it near the top of a HUGE stack of things I need to read. Let me just say insatiable curiosity and exceeding laziness are two characteristics I have that don’t mix well together. Isn’t the increase in US Chinese imports in Figure 2 at least partially explained by the increase in the value of the dollar? From Menzies paper: “… the value of China’s exports to the US responds negatively to real renminbi (RMB) appreciation, while imports respond positively.” I’m somewhat surprised that the US exports to China haven’t changed as much. As I read this graph, a dollar buys less RMB today than it did 10 years ago. But of course one could cherry pick a narrower time frame to get any result one wanted! Of course this quote assumes that the dollar is devaluing but for some reason CoRev reads it as the dollar getting stronger! The RMB has gotten stronger and China’s net exports/GDP have declined considerably. There are a lot of reasons for noting that the bilateral balance with the US is a meaningless outlier. And yet this is all Team Trump want to talk about! Pgl, I was considering the Trump era portion of the chart. i was wrong in where I thought the dollar was. I remembered the 2017 rise, but haven’t followed it since. “Of course this quote assumes that the dollar is devaluing but for some reason CoRev reads it as the dollar getting stronger!” Yes, I assumed the dollar was still rising like 2017. Doesn’t that allow the US to buy more from China? If not please explain why not? This is a nonsense question. We choose to buy goods from different suppliers based on things like relative prices. Now if you have not even taken the first week of a Principles of Microeconomics class, there is no need for anyone to engage in a discussion with you. Pgl, and that was another deflection. Yes or no would have been appropriate. so you do know how to answer a simple question! During 2016, the dollar appreciated against the RMB. During the first year of the Trump Administration, this appreciation was reversed so over a two year period, the exchange rate changes netted out. It does turn out that the U.S. trade deficit with China fell to only $336 billion. These are the facts. Now in CoRev’s complete amateur hour way – we let him spin whatever nonsense he wishes! Amending the previous. Our bilateral deficit was $333 billion in 2015 and was $336 billion in 2017. Over this two year period, the net changes in the exchange rate was virtually nil and the net change in the trade balance was virtually nil. I’m sure CoRev will blow this discussion up by accusing me of ignoring a whole host of factors like the number of fish in Brazil. Which was the favorite joke of the Taiwanese professor who taught me econometrics! There’s a paywall on that. I apologize. I was watching it LIVE and presumed they might allow that one. Nothing you can’t miss, just kinda interesting. If I see a youtube link on it or something I’ll try and put it up in the next 2 weeks. Well, the overnight markets don’t seem to like Trump’s latest outburst. Come to think of it, the markets have been pretty bad ever since the tax “cuts” (actually tax increases) were enacted. Escalating the trade war could have another unintended consequence that doesn’t seem to be getting a lot of attention. If this continues, then consumer prices will rise. Inflation is already running at or near the Fed’s 2% target. If these tariffs put upward pressure on inflation, this could put the Fed in an awkward position. The Fed will have to choose between abandoning the 2% target or raising interest rates sooner than otherwise expected. The other day Paul Krugman pointed out that a trade war by itself might induce a moderate recession (~2% drop in GDP). But Krugman didn’t factor in the possible effects of a sooner-than-expected hike in the interest rate, which could turn a moderate recession into a nasty recession. Tariffs cause one-time increase in prices not a general increase in inflation that is sustained over time. Let’s hope the FED gets this and does not overreact. True enough. OTOH, a trade war could mean a series of one-time price hikes rather than a one-and-done kind of thing. Great post as always Menzie. Here’s a typical “dialogue” between a the Trumpsters (T) and a normal person (N). Actually I am surprised when Mr T hasn’t started blaming Obama for the deficcit with China. Maybe he will do that when prices start rising as a result of his policies to deflect blame. T: it’s Obama’s fault that we are being r… by China on trade. Look at the deficit, a “gazillion” dollars. N: it’s more complicated than that. And the deficit actually rose during Bush and was stable under Obama. T: this is fake news. You guys always defending Obama and covering up his scandals. N: What? This is just a fact. Look at this chart from the BEA that I found in econbrowser in a blogpost by M Chinn. T: Is this Chinn guy American? A real American? Hmm. Quite a few knock-on effects need thinking through. e.g., For fungible US-produced commodities like soy beans, lumber and cotton, if China puts tariffs on them, won’t the soybeans etc. find their way to non-China import markets that have not imposed tariffs, while China will switch to import the commodities from producers other than the US? There will be extra logistics costs, but won’t supply and demand still balance out, without a big revenue drop for US producers? Depends if there are big enough non US producers and non-China consumer nations, obviously. Another factor that may reduce the sting is if the tariff revenues were offset to consumers in the form of reduced other taxes. Julian B, It depends on Supply and Demand equilibrium. I would expect the market to adjust fairly quickly. Unless demand changes negatively, if/when China imports from non-US sources they take supply away from another importer. Accordingly US exports should find their way to that losing importer. As you say, prices should be impacted by handling costs. May i advice not to forget in this drama, that China owns the U.S.